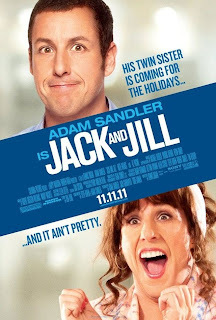 It would be pretty easy to write a snarky, above it all review of JACK AND JILL, the new Adam Sandler product opening this weekend, but what's the point? The fact is, if you heard that Sandler was making a movie in which he would play brother and sister twins and thought that sounded like a pretty good idea, chances are you'll enjoy the movie. It's innocuous entertainment that provides a fair number of (mostly) family-friendly laughs. There's also the spectacle of watching Al Pacino, playing himself, smitten by the female version of Sandler, which is kind of surreal. Ah what the Hell, I'm gonna' write the snarky review anyway. There's really not much of a plot here. Jill (female Sandler) is shrill and annoying, and no one in their right mind would want to spend more than five seconds in her presence. And yet, Jack (male Sandler)'s family, which includes wife Katie Holmes and a couple of kids, all feel sorry for her and try to get the two siblings to get along. Meanwhile Jack, who runs an ad agency, is trying to get Al Pacino to star in a Dunkin Donuts commercial for a new coffee to be called “Dunkacino”, and he's not above using Pacino's attraction to his sister as a bargaining tool. From this setup, hilarity more or less ensues. I admit, I did laugh once or twice in spite of myself, but mostly I just groaned. I was also amazed at the amount of blatant product placement in this film, which may well set some sort of record. Much of this comes out of Jack's job in the advertising industry, but there's also a good 15 to 20 minutes in the third act that could serve as an infomercial for Carnival Cruises. I actually feel kind of sorry for Adam Sandler. He's at the point in his career now where he's not the hot young edgy comedian anymore, and if he tried to do another HAPPY GILMORE or BILLY MADISON it would just come off as sad and pathetic. Sandler has tried to do some more serious work, and he's been good in some of it. Unfortunately, movies like PUNCH DRUNK LOVE and FUNNY PEOPLE weren't commercial successes. So Sandler does what so many other aging, once hip comedians do: he makes family comedies. There's also a hint of late-eightes Burt Reynolds in this and other recent Sandler films. Just about everyone Sandler ever worked with has a bit part or at least a cameo in JACK AND JILL. I'm sure the guys all had a blast hanging out together again, and it serves as kind of a workfare program for aging SNL alumni, but in the end it's no more a good movie than CANNONBALL RUN II or STROKER ACE. 2 out of 4 stars. This is funny. I wouldn't feel too, too sorry for Adam Sandler, though. He is unbelievably rich. The commercials make it seem like a Christmas movie--is it? @ Pam - true that. I guess it's just a shame when someone has both talent and ambition to use that talent, but audiences only want to see them do the same thing over and over. @ Joanna - More a Thanksgiving and Chanukah movie, since Sandler is Jewish both in real life and in the film. Jill shows up for Thanksgiving and her stay keeps getting extended, eventually into the New Year.